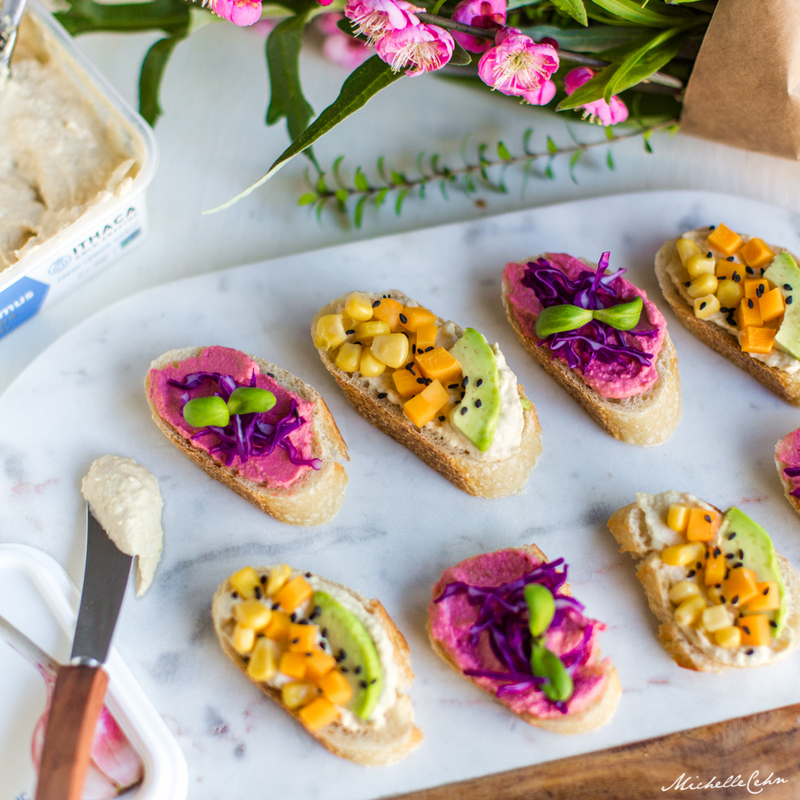 If you’re looking for a simple appetizer or party food to serve up to friends, look no further than hummus crostini! This simple concept can be customized in a million ways. Let your creativity go wild! The best part about this appetizer is that you can get creative with ingredients you have on hand. 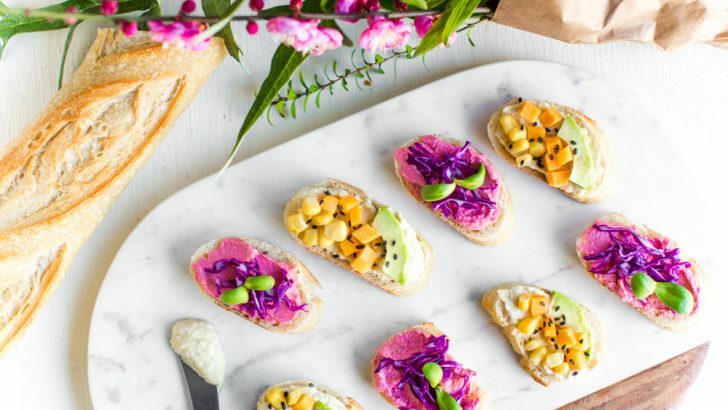 All you need to buy is a baguette, hummus (or ingredients to make your own hummus), and any extra colorful toppings you want to use. You’ll slice the baguette into ¼ inch slices (as pictured) and can either bake them before topping with all the fixings or skip that step and enjoy them soft (like I did). If you’d like to bake your crostini for a crispier and more traditional finish, here’s how it’s done. But don’t worry, if you’re tight on time or just feelin’ lazy, you can absolutely use unbaked baguette slices (that’s what I used). Arrange your baguette slices on a baking sheet. If you’d like a more decadent crostini, you can lightly brush them with olive oil (but that’s totally optional). Bake them at 350 degrees for about 15 minutes until they brown ever-so-slightly. Let them cool before spreading hummus and your toppings on each. If you’re serving these at a party, you can bake the crostini in advance, store them in a bag at room temperature (not in the fridge). Then, top them just before serving so they don’t get soggy! I made these using two types of hummus: a simple garlic hummus and beautiful pink beet hummus. You can get creative will all sorts of hummus varieties. You may be able to find fun varieties in stores (I found this beet hummus from Ithaca Cold-Crafted), but you can also make your own by blending colorful elements into plain hummus. Beets work great to create that pink pop of color that’s almost too pretty to eat. But you can also make a whole rainbow of hummus colors. For example: orange hummus (add carrots), green hummus (add arugula or frozen peas), yellow hummus (add turmeric), and beyond. If you’re a long-time reader here at World of Vegan, you’ll know I’m a little obsessed with rainbow foods. So please do go have fun making a rainbow of hummus! These are ingredients that I had on hand, but you can use whatever you want. Explore what’s in your fridge, your pantry, and what’s in season in your local grocery store. I’m sure you’ll come up with something equally beautiful (and delicious)! If you’re not a fan of hummus, you could top these with a spreadable vegan cheese instead! We have an amazing no-wait 5-ingredient vegan cheese log recipe here that would work perfectly. If you have kiddos, this would make a fun kitchen project. You can set up a little toppings bar of hummus and pre-chopped veggies and allow them to decorate their own! 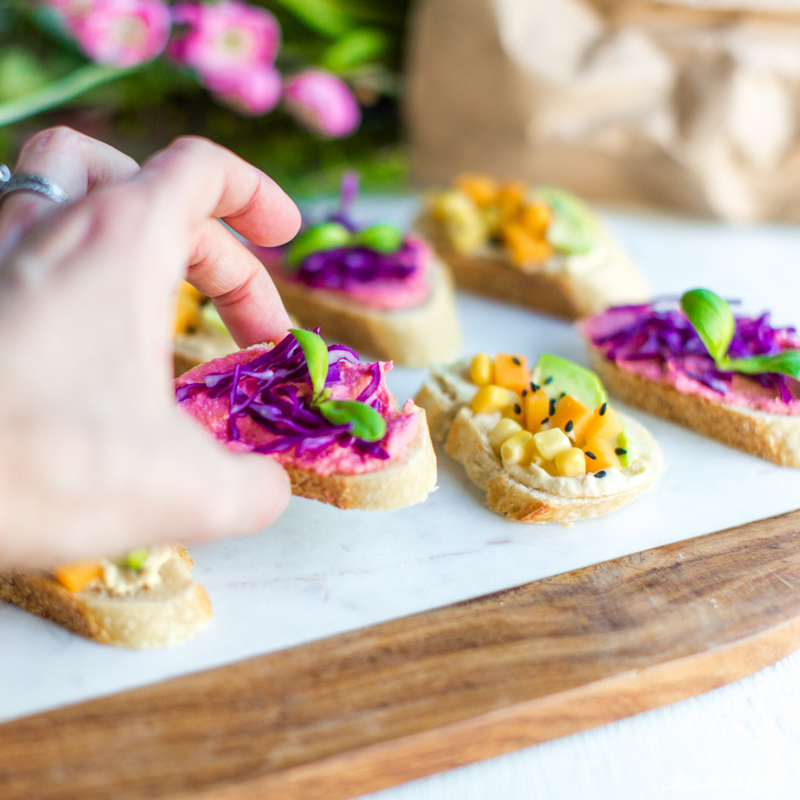 Hungry for More Fun Vegan Appetizers?